I stepped away from the computer this weekend and it felt fabulous! BUT today I have some cool news involving an great giveaway and another "party" that is all for a good cause. Now Comfort Works is hosting an AMAZING G I V E – A - W A Y at The DIY Club Comfort Works offers curtains and sheers, Ikea slip covers, cushions, coverlets. Great quality and so much to choose from! You will not be disappointed. A winner will be chosen at random by the DIY CLUB, and will receive a store credit. 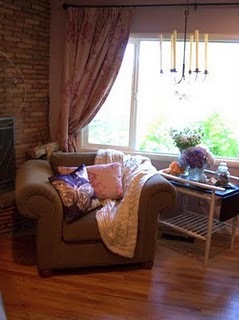 The winner will be able to choose from any of their current products and fabrics, or work with a Comfort Works representative to create their own DIY project (like Cheri’s parson chairs). Offer is available till November 30th. You can enter this give-a-way from Sept 1-Sept 14. Each comment left on the post counts as one entry in the drawing. 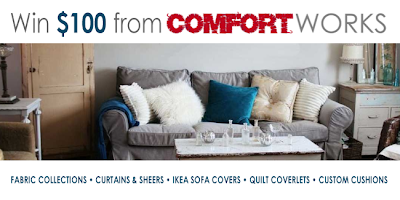 1)To win simply tell us what’s other products should Comfort Works cover up ie: slipcover for bedheads, custom made laundry bags, bean-bags, shoe bags, non-ikea slipcovers etc. 2) ”Like” Comfort Works Facebook page and leave a comment stating that you have done so. 3)Post about this giveaway on your blog, your facebook page, or twitter. Leave a comment here with the links of your post. Participants should leave a separate comment for each mentioned way to enter-above. If you do not have a blog–We do need an e-mail to be able to contact the winner. If the winner has not contacted us with their e-mail information prior to the drawing we will do a re-draw. 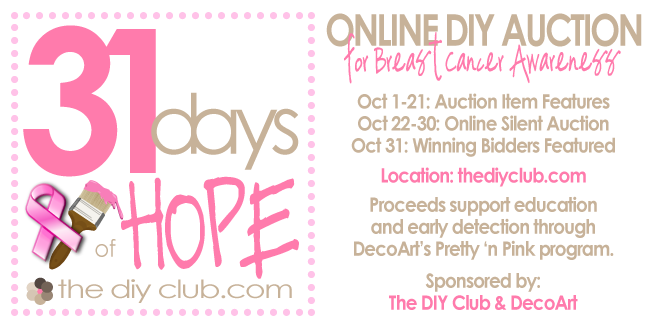 Join us during the month of October for The DIY Club’s 31 Days of Hope! We’ll be hosting a silent auction right here at The DIY Club. What a great way for women to support one another in being strong and healthy! 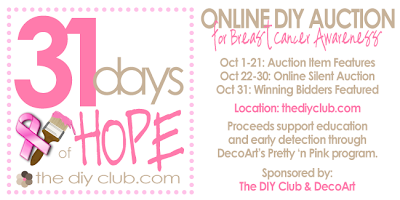 Proceeds benefit DecoArt’s Pretty ‘n Pink program, which supports education and early detection of breast cancer by donating portions of its Pretty ‘n Pink sales to the National Breast Cancer Foundation. Pretty ‘n Pink was created by Etta Brown, a breast cancer survivor and former VP of Sales & Marketing at DecoArt. What is the connection between DIY crafts and breast cancer? Research shows that crafting benefits health by reducing stress, which can be therapeutic for cancer patients, cancer survivors, and their family members. Don't forget...The DIY Club Project Party is happening NOW!